For this you must first load a single uncompressed wave-file to play. The file must also contain the same number of channels as the stream you are transmitting. So, stereo file for stereo and mono file for mono. 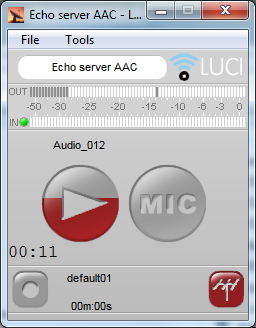 Supported sample rates are 44.1 and 48 Khz. Supported bit depth is 16 or 24-bit. To load a single file choose menu File / Open file for playing. 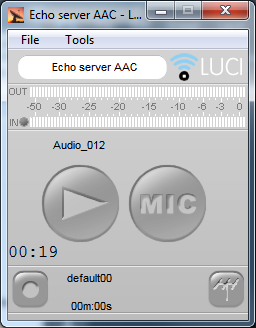 After you have chosen the file called ‘Audio_012’ for instance, the name will appear above the ‘Play-button’ and the total recorded time of this file will appear at the bottom left of this button. After a short live introduction you can now add the prerecorded file by pressing the ‘Play-button’. 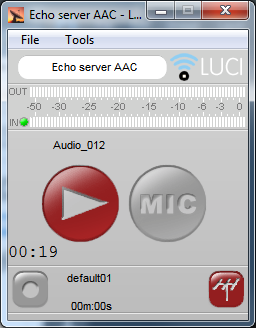 You will now see that the MIC is switched off automatically (for the case where you have set the fade to be Auto mic mute in LUCI Studio Setup) until the playing of the prerecorded file is finished. Then it will switch on again automatically. Watch the time-indicator at the bottom left of this button. It will start to count down and the ‘Play-button’ will gradually ‘run empty’ (see next screenshot). If you want to interrupt the transmission of the pre-recorded file: press the ‘Play-button’ again, or press the ‘MIC-button’ in order to immediately switch over to live broadcasting yourself. You can of course also transmit only pre-recorded files without actually broadcasting live yourself. Watch the time indicator at the bottom left of the Play-button. It is counting down and the Play-button will gradually ‘run empty’. 11 seconds left and then this file has been transmitted completely.